DISCLAIMER: I received free product for this project. However, if I don't love a product, I won't recommend it to my readers. 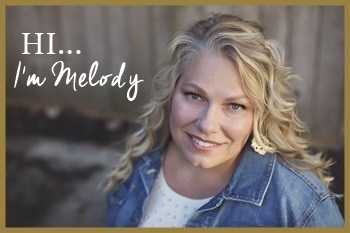 I'm so excited to share this project with you today! Why am I so excited you ask? I got to try a new brand of paint paint! 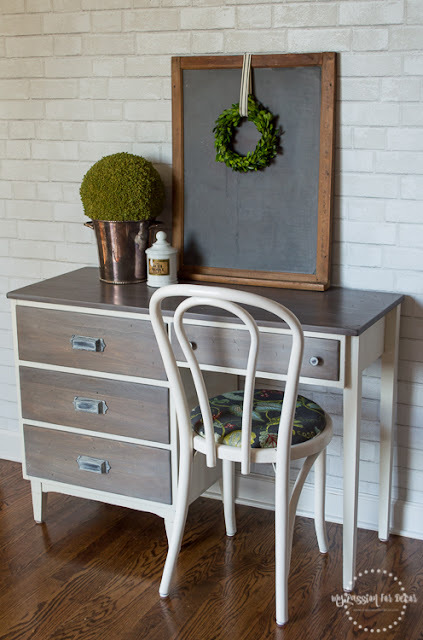 If you've been following along here for awhile, you know I've tried a lot of different chalky finish paints. WELL, I used a new-to-me brand of chalky finish paint called Dixie Belle Paint Company and I am in love! One of the many reasons I liked this paint was the cost. 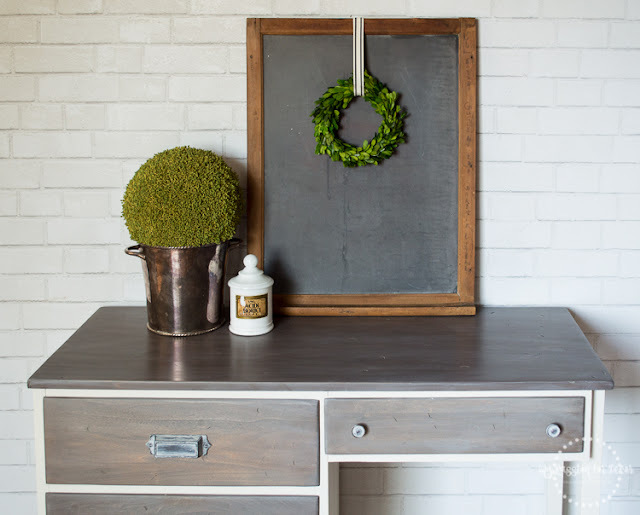 The price is a bit lower than some of the other chalky finish paints on the market today. I get a lot of emails from readers asking for lower cost options, so I'm always on the lookout for a great paint at a lower cost. 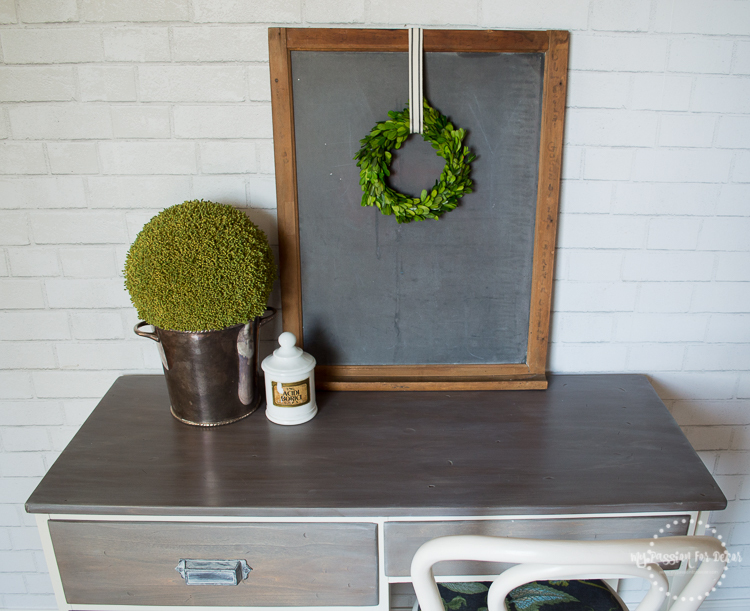 All the Dixie Belle paints have zero VOC and clean up is quick and easy with a bit of soap and water. It can be used on almost on any surface with little, to no preparation. Although, no matter the paint, I always recommend starting with a clean, dry surface. Also, I recommend scuffing up any shiny surfaces with sandpaper to give the paint extra grip. 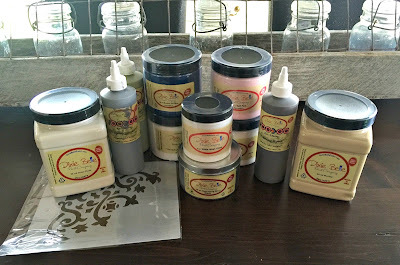 Dixie Belle Paint Company, completely spoiled me and sent me lots of fun products to try! Now, let's talk about this desk!! I bought the desk from a neighbor last fall and yes, it's sat in the basement patiently until I knew what I wanted to do with it. 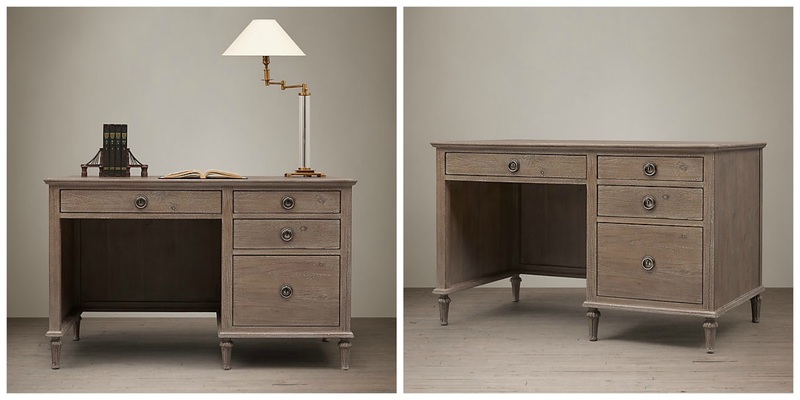 I'd originally wanted to do a dark navy desk with maps on the drawer fronts. My whole plan changed once I realized the desk top wasn't laminate like I thought it was. I was pleasantly surprised when I discovered the desk is solid wood! Here's how the desk looked before. The top was a bit beat up, but other than that, it was in great shape. 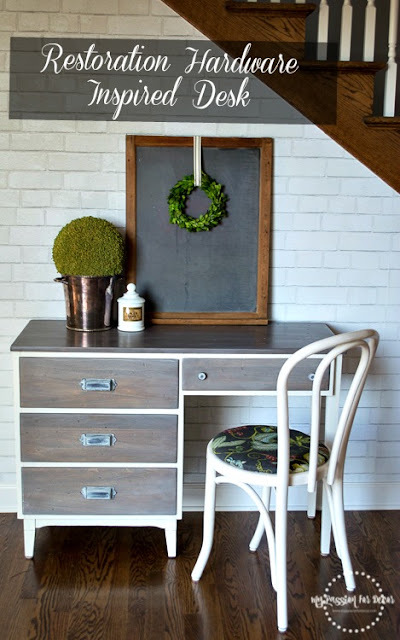 You'll notice in the before pictures, the small top drawer is a different color then the rest of the desk. This was my test drawer and at this point I'd sanded and played with a bit of stain to see if my plan would work. My inspiration for this piece is a desk I love from Restoration Hardware. The RH desk has a price tag of $1645. Let's just say my desk was a lot less than theirs! I wasn't going for an exact copy of the desk. 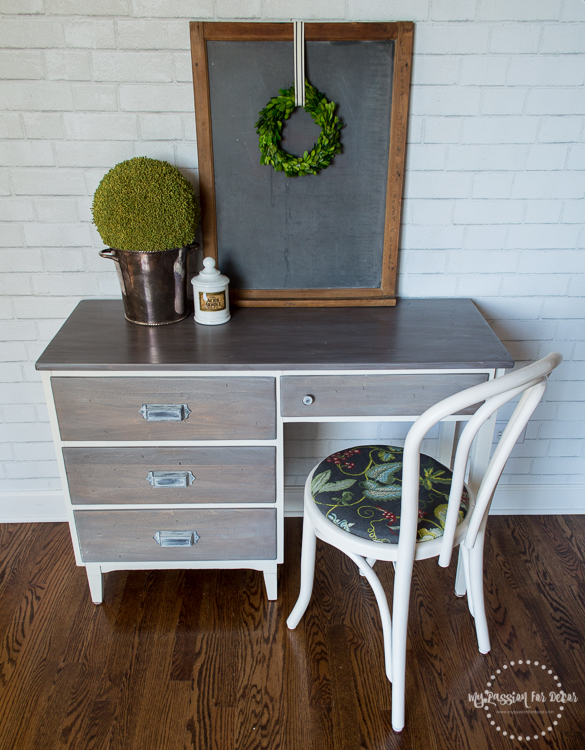 My main inspiration was the antique gray wood finish. My first step was to sand the desk top and drawer fronts. The drawer fronts were quick and easy to sand. 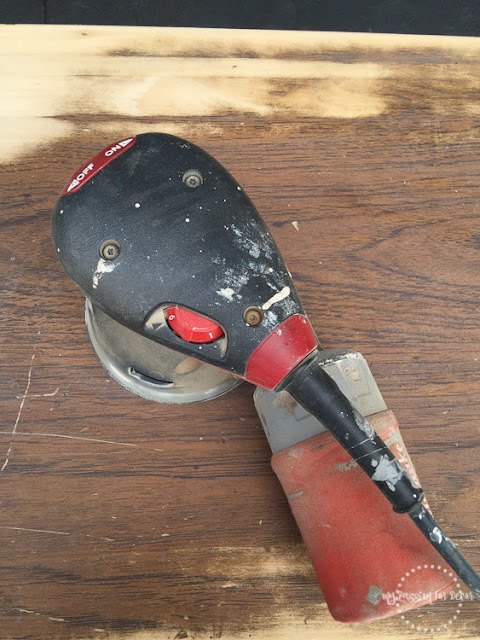 I started with 100 grit sandpaper and finished with 220 grit. The desk top took a little longer to sand due to a thick protective coating on the surface. I was so happy once I started sanding and saw the pretty, light wood underneath. I believe it's white birch, but don't quote me on that! I'm not an expert on wood types. Once all the sanding was complete, I applied my first coat of stain on the drawers and desk top. I started with Dixie Belle's Voodoo Gel Stain in Tobacco Road, which is a nice brown, almost walnut shade. I wanted the wood to have some depth and not just look gray and the darker color gave me a deeper base to work with. The Voodoo Gel Stain goes on easily and I love that it's in a squirt bottle. I'm a messy painter and the squirt bottle helped me keep everything cleaner than usual! I applied the stain, let it sit for a bit, then wiped it off. I did the same thing with the Voodoo Gel Stain in Up in Smoke, which is a beautiful gray. 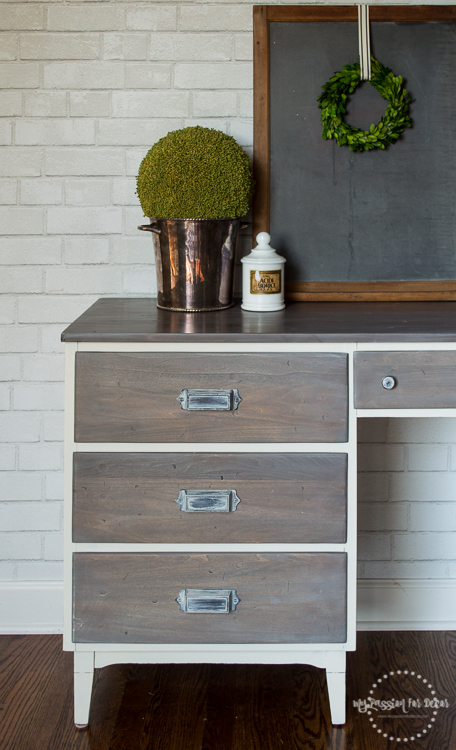 The Up in Smoke with the Tobacco Road gave me the base for the antiqued gray like the RH inspiration desk. 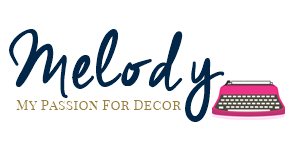 Once all my stained surfaces were dry, I wiped on some watered down Dixie Belle Paint in Buttercream, then quickly wiped it off. I did this a few times until I achieved the look I wanted. I needed the paint to be light and transparent to enhance the stained wood, not give complete coverage. 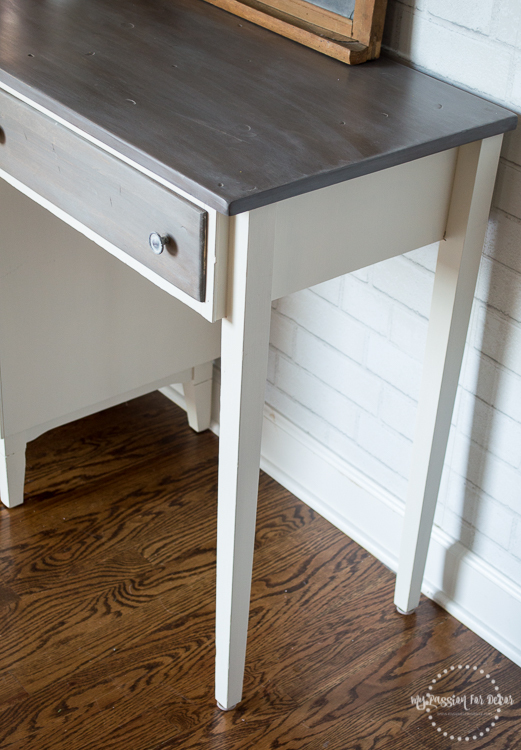 After everything was dry, I sealed the desk top and drawers with Dixie Belle's Best Dang Wax in black. Isn't that a great name?! The wax goes on nicely and the black wax gave everything such depth. Once the wax was dry, it was easy to buff to a nice sheen. 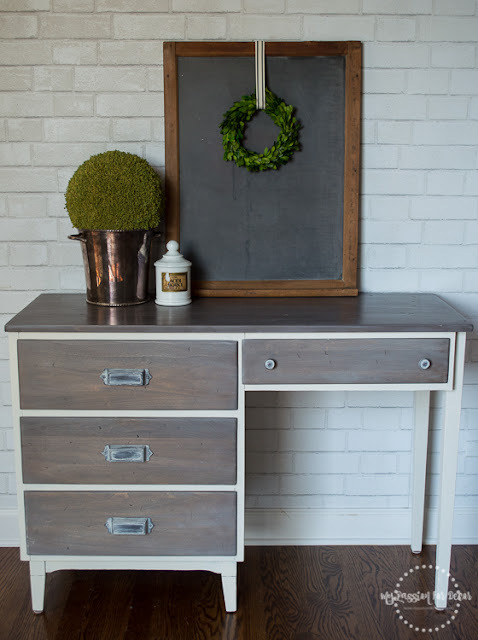 I painted the body of the desk with Dixie Belle Paint in Buttercream. The color is a nice soft off white. Not too creamy, not too white, just right! It's my new favorite! I lightly sanded paint with 1000 grit sandpaper and that was it! Now for the finishing touches! The cup drawer pulls I've had for years. 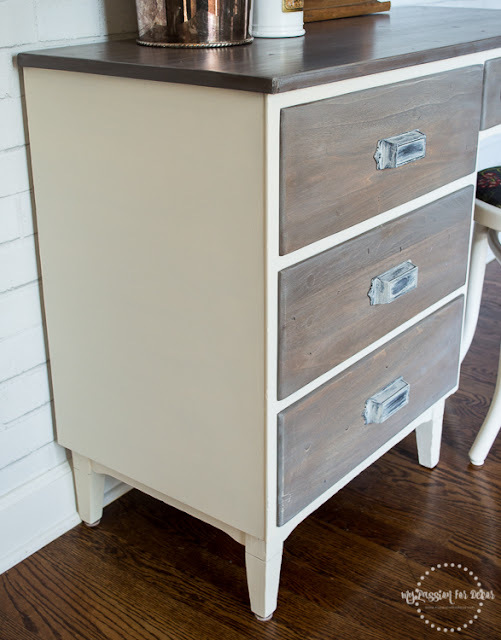 They original finish was black and didn't look right with the antiqued gray drawer fronts. There was too much contrast between the gray and black for my liking. This was an easy fix though! I brushed on a bit of the Buttercream paint and wiped off the excess until I had the look I was trying to achieve. 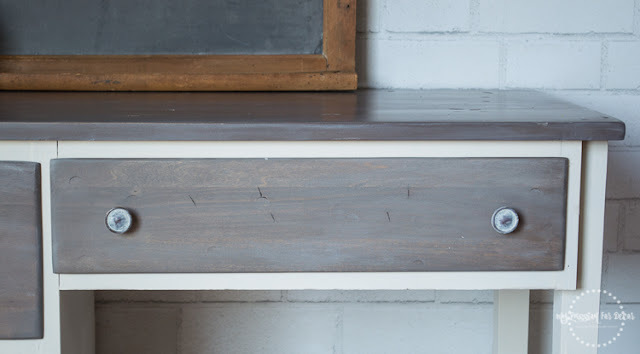 The small circular knobs on the center drawer are original to the desk and were also black. I applied a bit of Buttercream to them as well so they matched the cup pulls. 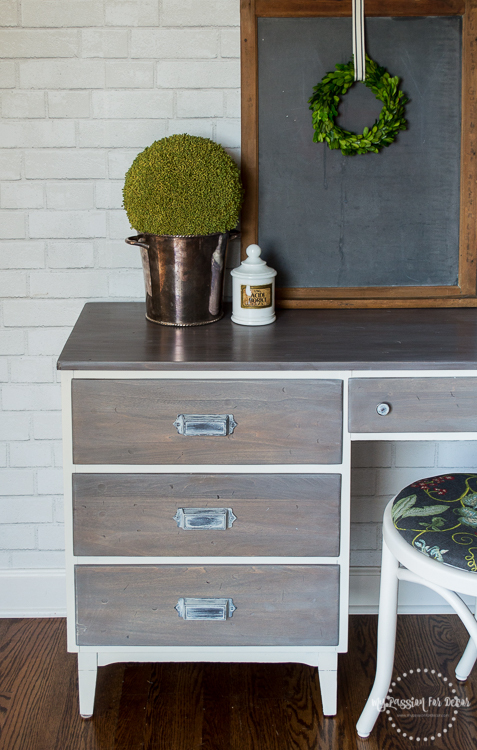 Here's the finished desk. 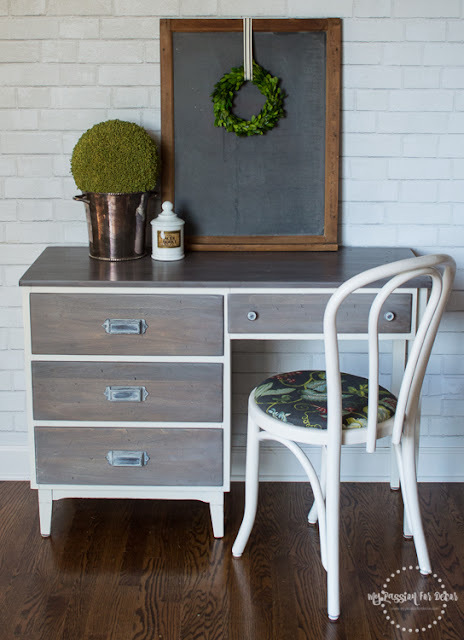 I'm head over heels in love with this desk. I'm keeping this one to replace my current desk. I'm totally in love with the finish and drawer hardware on this desk! 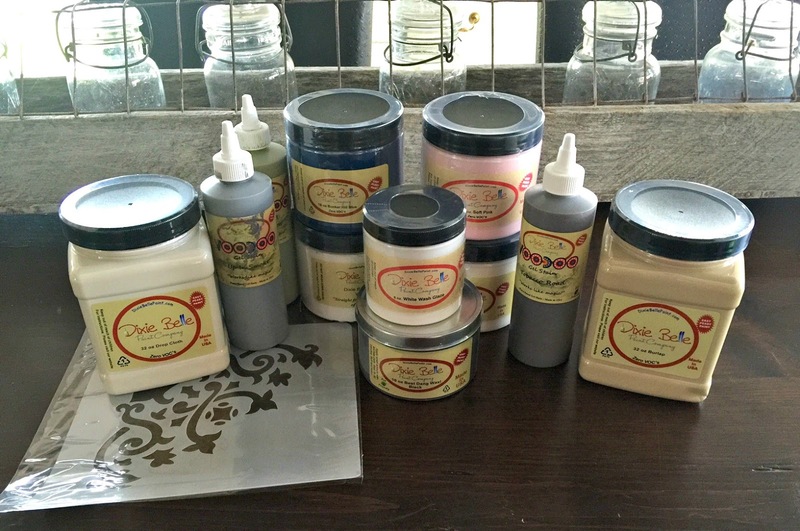 I'm so happy I had the opportunity to work with Dixie Belle Paint Company! 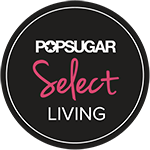 They've been great to work with and I love their product line. 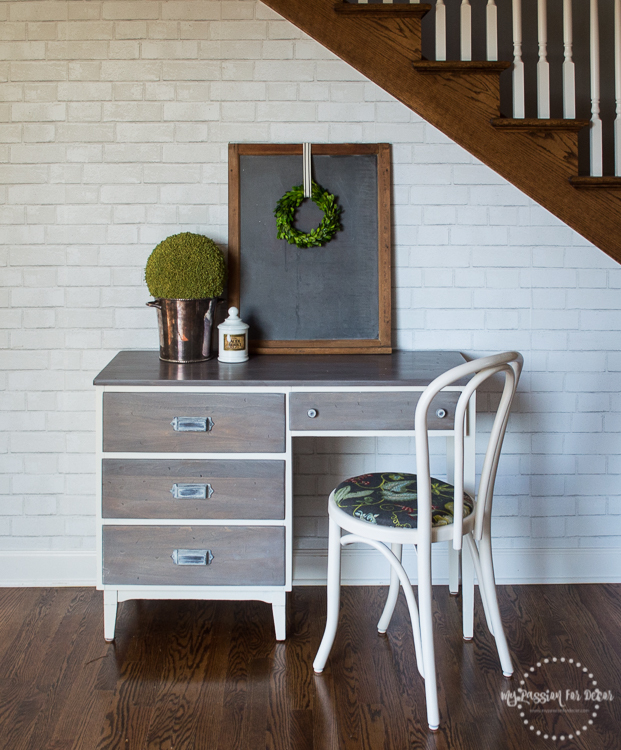 If you're looking for a chalky finish paint that is high quality and at a good price, I highly recommend Dixie Belle.